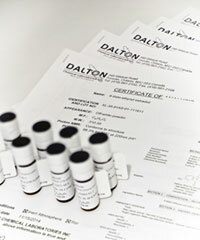 Dalton Research Molecules is your leading provider of high quality chemical compounds including reference standards, impurities, degradants and metabolites of APIs, natural products, diagnostic imaging reagents, and building blocks. Our catalog now contains over 2,200 compounds and continues to grow every day. Dalton Research Molecules compounds are ideally suited for research work, analytical standards, method validations and API impurity profiling. All of our materials are manufactured and shipped from our North American facilities. Our compounds are typically 95% purity or greater. We determine this high level of purity by HPLC to ensure accurate assessment of our compounds. Dalton Research Molecules sell only the highest quality materials. Our compounds are available for purchase individually or in family kits in a variety of pack sizes.If you don’t see the chemical compound you are looking for, please ask us. We have the ability to customize our products. Dalton Research Molecules is a division of Dalton Pharma Services, and has been providing specialized discovery, development and manufacturing services to the global pharmaceutical and biotechnology industries since 1986. Visit Dalton Pharma Services to learn more about our contract services business.